CNCNZ.com began as a very small page in October 1997 with a webmaster who knew nothing about coding a website. Like many other people in the community over the years I started with my own Red Alert site called the Original Red Alert Zone, as the name suggested I covered the classic Red Alert. News wasn’t really a “thing” we did back those days, in fact the main page was one of those geeky welcome to my website pages. I stuck with the site, learning new stuff about HTML and how to code pages better. As news and information about Tiberian Sun started emerging in late 1997 I split the Original Red Alert Zone site into two sub sites, the Original Red Alert Zone covered Red Alert while the new Tiberian Sun Zone covered this new C&C. Again “news” as we see it today was not a part of its content, all I had at the time were rumours of Tiberian Sun and fuzzy screen shots from the big PC Gamer preview. All of this was hosted in my ISP’s client web space at the time. As we moved onto early 1998 the community started coming alive, many sites were taking more professional approaches, developing fancy layouts, rounding up big collections of staff to run the sites. Even making bold statements such as purchasing domain names. As we hit the middle of the year and not wanting to be left behind I started planning an entirely new Tiberian Sun based site. The first step was to purchase a domain name. Since I wanted to retain a New Zealand identity, letting the overseas fans know that New Zealanders were just as crazy about C&C as they were, I decided to get a .net.nz domain name, tiberiansun.net.nz was registered. With the new domain name a name change occurred, to what else but TiberianSun.Net.NZ. Again this was hosted in my ISP’s client web space. Once TiberianSun.Net.NZ was opened it finally featured news updates, since I knew nothing about CGI scripting the site was updated in Notepad and the index page uploaded via FTP. It was cumbersome, time consuming but it was all I knew. The site was now fully functioning as TiberianSun.Net.NZ and was being updated just about everyday and it was becoming more popular. Stacks of content was added, none of it exists today though, it has all been re-written a few times over the years. With popularity comes problems, TiberianSun.Net.NZ was getting a lot traffic, all the extra hits just killed my ISP’s server, luckily I knew him personally and he didn’t charge me for the bandwidth the site had used. But he did suggest I search for someone who could host it and not have their serves meltdown in the process. One day I found out about a New Zealand based gaming site and network that had started earlier in the year. Games.Net.NZ, they hosted many sites with Quake being most popular for some reason. 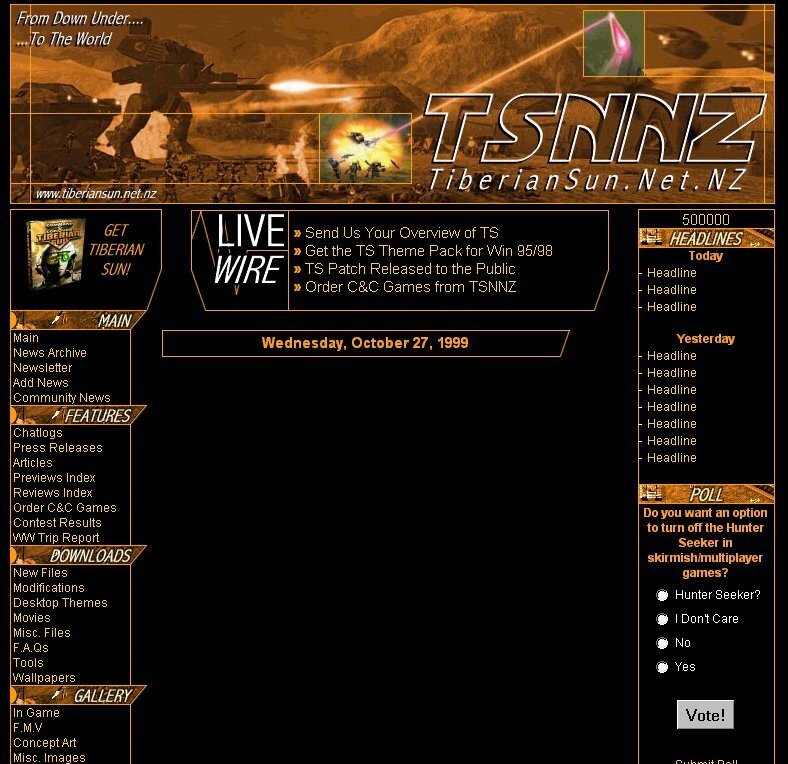 TiberianSun.Net.NZ was the first Games.Net.NZ hosted site to be on its own domain name. I was happy to be on Games.Net.NZ until around September 1998, for some reason FTP access was poor, and for many weeks and the site was left untouched since I could never log in. Growing impatient with the Games.Net.NZ admins my ISP at the time agreed to host TiberianSun.Net.NZ again because their servers had been upgraded. This all happened during September and October. Once November rolled around I knew the hosting on my ISP’s server was getting out of control again so I closed the site for a few days…. or was it weeks? Getting the site popular had many benefits. I made many friends online that year and none bigger than Cyberman0 from the The Westwood Underground, we started speaking one day, I mentioned that I needed hosting for TiberianSun.Net.NZ, he said he was interested in expanding the The Westwood Underground’s stable of hosted sites, even though The Westwood Underground already hosted a popular Tiberian Sun site, Cyberman0 threw me a life line and agreed to host TiberianSun.Net.NZ and make it part of the The Westwood Underground network. Also by this time the shortened nick name of the site became TSNNZ, I don’t know who started it but it stuck with me. Once the site was re-opened on the The Westwood Underground servers so many new features were added, the entire site was recode to use Server Sides Includes (SSI) making it easier for me to update the pages. And to make things even cooler a news script was set up. With the news script and SSI in place I was using all my free time updating the site. With help from The Westwood Underground some simple forums were setup, they were nothing like what we have today but they worked, they got a fair amount use of to. Early 1999 was upon us, and TiberianSun.Net.NZ was constantly updated, I had added some news updaters and a co-webmaster in late 1998 so someone was always updating TiberianSun.Net.NZ everyday. All of a sudden the I became we! As the months rolled by we had to endure the endless delayed releases of Tiberian Sun, however we used this time wisely, creating new layouts, always updating content and news and seeing popularity increase. In August, Tiberian Sun was finally released, the game was good, it was C&C but it did lack lots features that were hyped during the build up. By early October it was clear that TiberianSun.Net.NZ could not survive as Tiberian Sun based site, I then started making plans, these plans were for a change. A BIG change! We made a server move to EA-Central, as you can tell by the name they hosted Electronic Arts game sites. They lacked one thing; a site covering EA’s recently acquired product and company, C&C and Westwood Studios. With that in mind the ground work was laid for Command & Conquer NZ, a spin off if you will of TiberianSun.Net.NZ. With the new name came a new layout, new colours (the famous blue scheme) and of course a new domain, cnc.net.nz. It was a lot of work transforming a site that covered one game to many games. Because at the time we had the original C&C, Tiberian Sun, Red Alert, Sole Survivor and early details about a game called C&C Commando, later to be called C&C Renegade. 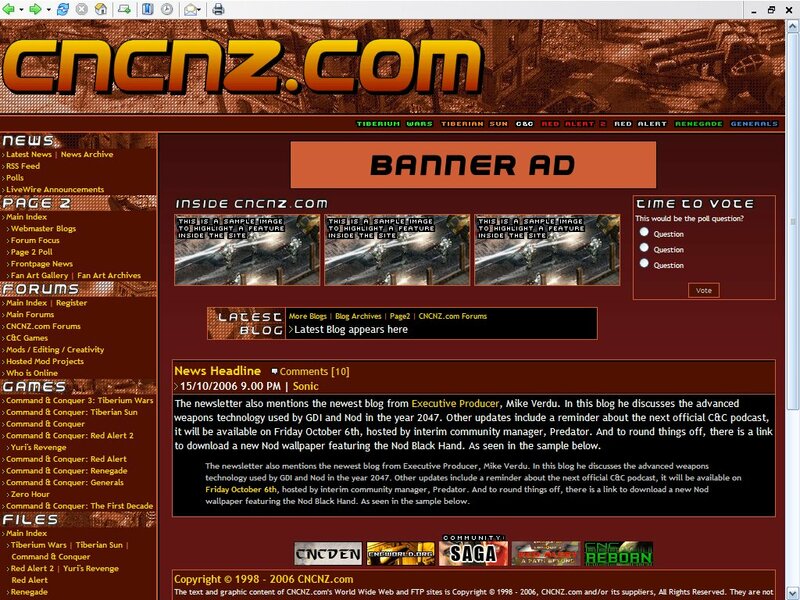 1999 came to end and we had settled at EA-Central as Command & Conquer NZ, once again though our site’s name became shorter and soon the name CNCNZ started doing the rounds. I eventually caved in and redesigned the site’s logo to say “CNCNZ”, even though this was moving away from my original idea of a full New Zealand based site, it made sense, it was hosted on a server in the United States, and the staff was from different countries. 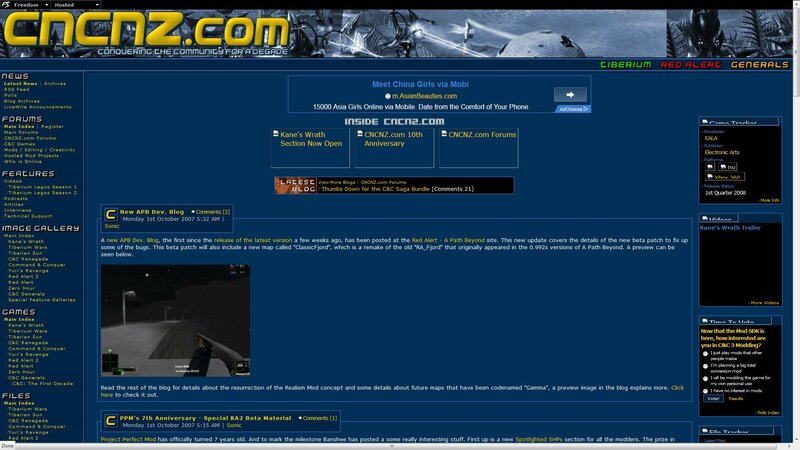 In the first part of 2000 I wanted to sub host some C&C sites below CNCNZ, the idea was that we would have sites for all the C&C games and CNCNZ would feed off them, this never really worked out so our network site were given individual status. Over the year we added (or helped create) sites like Renegade Online, Tiberian Twilight HQ and Red Alert Resurrection. We even hosted a clan site called The Troopers. In July 2000 the domain name cncnz.com was purchased, this gave the site a bigger image. With the new domain another server move was made. This time to Project 77. This was a huge move because not only did we have to move CNCNZ, our four network sites needed to move with us. Once were set up on Project 77 another network site was added, C&C Mods, this site died off fast though. Since we were on a .com domain I decided to change the site name just a bit, we officially became CNCNZ.com. People always ask why the site used this name and this history page explains the slow evolution of the name. Before we re-launched as CNCNZ.com we almost used the layout shown in the screen shot to your right. It was dark layout with a very different colour scheme. This layout was designed by an old friend. It was eventually aborted due to a major problem, it cause browsers to crash! Eventually I took on more duties at Project 77, which had grown to a very large network, almost out of control really. Running Project 77 and CNCNZ.com became to much for me, I was basically in charge of Project 77 and it frustrated me greatly, I ended up resigning and moving the CNCNZ.com Network to MadHosts, a move I would later regret. This is were we saw out 2000. Things were going really good at MadHosts, until one day in late April of 2001 MadHosts pulled the plug on our server causing CNCNZ.com and it’s network to disappear, I was never notified of this and it caught me off guard. We were out of action for many weeks; we had lost all of our data, files and forums. After searching around for some hosting solutions and noticing that good free hosting was hard to find I was referred to Gamers Pulse. I e-mailed the owner of Gamers Pulse, explaining my situation, his reply contained details of new accounts for CNCNZ.com and it’s network, we were rescued once again. In late May we re-opened CNCNZ.com on the Gamers Pulse network. It was great to be back and involved with the community once again. In October the Gamers Pulse server suffered a major crash and we basically lost everything again, it was a crushing blow. We started to restore CNCNZ.com for the second time in a year from our out dated backups, a lesson was hard learned here, always back up your important files! Gamers Pulse, as always, were quick to replace to the dead server with a nice new one, we had the basics of CNCNZ.com back up in a matter of days, after a few weeks it was all back to normal, all content and features accounted for, but not our forums, they never survived. At the time we were using a UBB based forum and it was a pain to back up, to grew to large to back up with a dial up internet connection. This was a great year for CNCNZ.com, I created a layout that featured some cool drop down menus, and I even flirted with a very different colour scheme of grey/silver/gold. It was a little odd at first but people warmed to it. One thing to note about 2002 was our lack of downtime, we had short outages but that’s normal for web servers, they are machines after all and eventually problems occur. The only major problem we had in 2002 was a small war with another C&C site. I won’t name names here but it was basically an argument over the grey/silver/gold layout I had created from scratch over the period of 3 weeks. When this new C&C site opened it’s doors claiming it would “change” the community and do things different to every other C&C site in the community, one of the owners of this site claimed that I stole the concept for their layout and the placement of it’s menus and navigation bars. You see since the grey/silver/gold layout used a drop down menu system across the top of the page there was no need for a left hand navigation bar. Only a right hand feature bar. Well this other C&C site had a similar layout, I agreed with them on that point, but having never seen this new site before I failed to bridge the connection of how I had stolen their layout. In the end I basically ignored anything that this site did and that was the end of it for me. Apart from some of our forum regulars here making their way to this other C&C site’s forums and leaving some nasty comments. They fired back and that was that. And through of all this many sites “shared” the same basic layout anyway, they still do to this very day. Like the previous year, 2003 was again a positive one. The grey/silver/gold layout had been replaced, as the site returned to it’s famous blue/sliver/gold scheme. Everyone who visited the site really liked that colour scheme, it was easy on the eyes, it just worked! On the gaming side of 2003, the EA Pacific team who previously released Red Alert 2 and it’s expansion Yuri’s Revenge announced and then released an entirely new C&C, while the community were expecting another traditional C&C, EA Pacific gave us C&C Generals, the first true 3D C&C. It had a new story, all be it a lite one, and cutting edge graphics thanks to the powerful new SAGE engine. Generals really gave the community a jump start. In the middle of 2003 and since we were still on the Gamers Pulse we took advantage of the PHP/mySQL features that a recent server upgrade offered and switched to phpBB based forums, retiring our old UBB forums in the process. The phpBB forums were great, giving our forum regulars what they had been wanting for a long time. By now it was common knowledge that Westwood Studios was no more, consolidated by EA into one company under the new name of EA Los Angeles (EALA), this was the new development home for C&C. Their first release was an expansion to Generals called Zero Hour. From this point on the community always felt like it was on the outside looking in. In previous years we were always getting inside info from Westwood to post on our sites. Since EA had taken over we were left high and dry. As we came to the end of 2003 it was very silent for many months. We had the usual stuff like a couple of patches for Zero Hour from EA but that was basically it. If it wasn’t for the all the mods in the works for Generals, Renegade and Red Alert 2 we wouldn’t have had much to report on. These mod teams kept us going! The New Year would be our 7th year online. A huge achievement by anyone’s standards. The problem with 2004 was for the first time we were entering into a new year with no official C&C product due for release, no announcements from EA about anything. By this point in time the relationship between the community and EA had grown very sour. It had been many months since a new layout was created for the site so I decide to start testing different ideas, colours and so forth, I didn’t want to tinker to much with the successful formula of the blue/sliver/gold scheme, I simply darkened a bit. By April I re-launched CNCNZ.com with a new look, new modified colours and a new attitude towards continuing our legacy by adopting the slogan of CNCNZ.com – The C&C Community Veteran! There was a mixed reaction to the new colours; these colours were leaning towards the purple side of the colour spectrum. After a few weeks everyone had gotten used to the change. News coverage in 2004 was again dominated by modding. There so many high quality mods in the works it was getting hard to keep track of. One that we covered in great detail on CNCNZ.com was Renegade Alert. I remember when I first played Renegade Alert online. I was so impressed with it, here was mod made by a team of talented Renegade fans, it was so professionally done. I would visit their site everyday following the progress of future releases. In August 2004 history repeated it self. One day I came online and noticed that CNCNZ.com was offline. I thought it was just a short outage and forgot about it. After a few hours and no access to the site I fired off an e-mail to Gamers Pulse, no reply. By now a couple of days had gone by and we received no word of what had happened. Gamers Pulse had simply been taken offline. Of course now I know the real reasons why Gamers Pulse went down but I can’t reveal them here, it wouldn’t be very professional of me. Anyway, once again CNCNZ.com was without any secure hosting. Wanting to remain loyal I waited for as long as I could for Gamers Pulse to return. Sadly they did not so I started my search for new hosting, it was slim pickings. In today’s modern internet world free hosting for gaming fan sites is hard come by. During our downtime I was able to keep people informed of our status by posting at CNC Boards. The team there were kind enough to give us temporary home for a couple of weeks so were never out of touch with the community. I finally found some new hosting; in fact I was lucky enough to have two hosting options. I could have linked up with my old friend Cyberman0 (see 1998 history) or join Gaming Source. As you can probably tell I went with Gaming Source, this was a relatively new network, they had only been online for about a year I think, already hosting couple of C&C fan sites, those being, C&C Den, RA Den and C&C Source to name a few. We were back online again by October, thank fully we had decent back ups this time so we lost very little in the way of files and forums. Late in the year, just before Christmas, EALA dropped a bombshell on everyone. A semi-unofficial announcement of a new a C&C game. Mark Skaggs confirmed it via an e-mail that Red Alert 3 would be their next foray into the C&C universe. 2004 came to an end. An air of uncertainty has lived with us through out first half of 2005, with nothing from EA regarding C&C’s future, however we continue to battle on. In late may we started making planes to celebrate the 10th anniversary of C&C. One big advantage for us for was getting EA’s approval and support for then events planned in late August/early September. As June rolled around we began to grow annoyed with our hosting arrangements at Gaming Source. 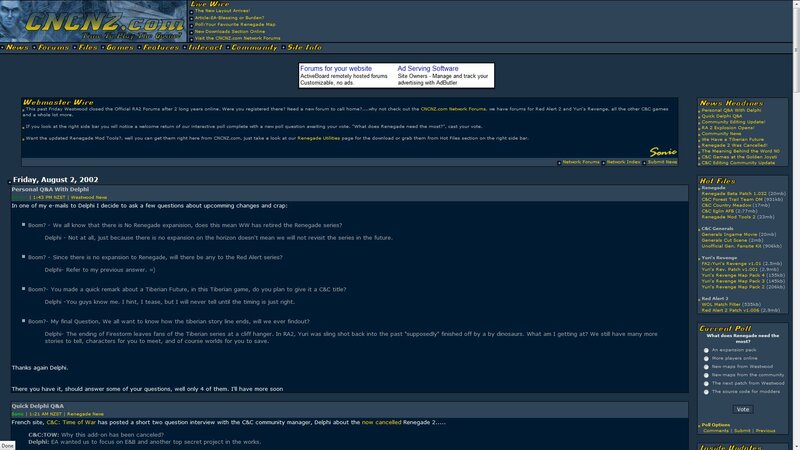 Out of the blue, and because he enjoys posting in our forums, Beowulf offered to host CNCNZ.com at Freedom Studios. We took his offer and made a quick server move. The best server change we have made in all our years online actually. Once late August/early September rolled around it was time to celebrate the 10th anniversary of C&C. CNCNZ.com spearheaded the entire community wide event. We arranged a contest with some cool prizes up for grabs. Created a new 10th anniversary style for our forums and interviewed many of the former Westwood staff who are now based at Petroglyph. We also set up an interview with Louis Castle at EALA. In middle October we celebrated our 8th year online. We have seen so much happen over the years, sites the have come and gone and then come back only to disappear once again, the demise of the once great Westwood Studios, we have seen the C&C franchise evolve and move to 3D only to grind to screaming halt. And through it all the one thing that has never really changed is CNCNZ.com, yes we’ve had different names, different layouts and many staff changes, but its still the same attitude and professionalism that we have always used since day one. In December we launched a few new features that have never been done before by a C&C fan site. The addition of CNCNZ.com Page2, a more light hearted approach to the news and sometimes way off topic featuring blogs by the webmasters. We also added the brand new Podcast feature, an MP3 style newsletter that would offer our commentary on all things C&C. Fast forwarding to April, a new C&C was finally announced after a what seemed to be an eternity with out a new game in the C&C franchise. The addition of C&C3 finally confirmed the unclear future of CNCNZ.com. A new C&C is the fuel we require to keep the site going. 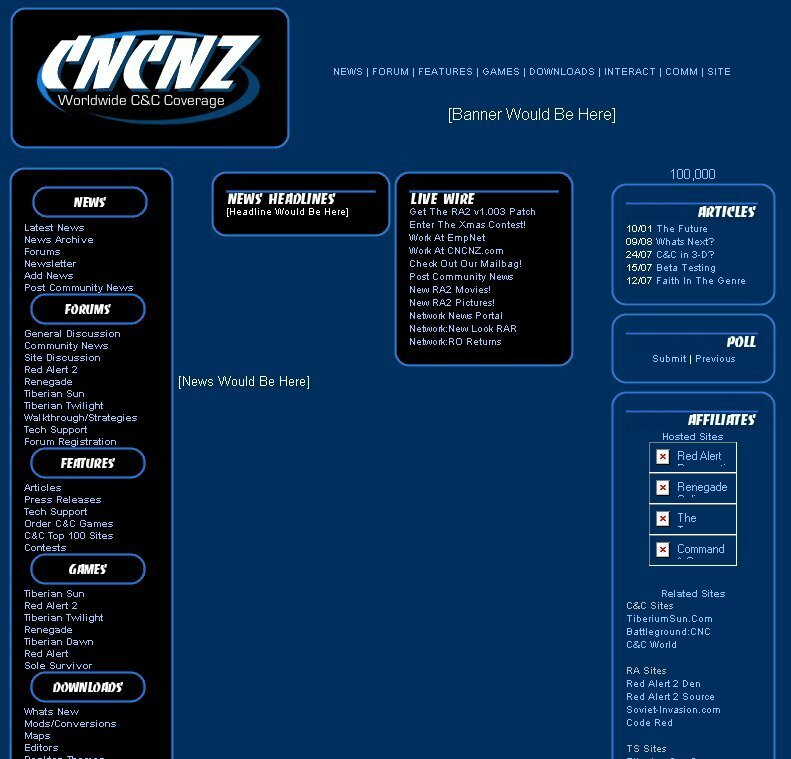 June of 2006 marked the first major revision to the CNCNZ.com layout in 2 years. We revealed a very different layout with some new colours and features that were not well received. Some people said it was to bright well other welcomed the changed. Majority rules in situation likes this so over the 2-3 days of the new layout going live, major changes were made to please the loyal visitors, this process saw the site return to it more traditional roots while still looking updated. In October of 2006 the site was once again redesigned, with the unveiling of Version 8.0 (v8 for short) it was a major recoding operation with lots of the sites back-end and scripts rewritten. For many CNCNZ.com stayed with its traditional themes of blues and purples, the new look went for a more bold and striking red style, can you say the Brotherhood of Nod? For the first time ever in our long history the daily news updates were integrated into the forums to increase discussion of relevant news topics. This is something that has always been in the drawing board but never eventuated until the v8 design. After a long drought between C&C games, 2007 marked the arrival of Command & Conquer 3: Tiberium Wars in March. This not only breathed new life into the community but into the site as well with the addition of new content and features. One of these key new features was the launching of the hugely successful Tiberium Legos video series. The mix of the classic C&C story telling, awesome C&C music and some extra comedy thrown in for good measure, this animated series proved to be a real winner. It was so successful that a second season of Tiberium Legos was confirmed. 2007 also marked the 10th year online for CNCNZ.com. And to start of with some special features the site returned to its traditional theme of blue/gold in late August, dubbed “Blue Resurrection”. 2008 was again a BIG year for C&C. With Kane’s Wrath, the expansion to Tiberium Wars as well as Red Alert 3 we pulled double duty covering both games. We also introduced Tiberium coverage but that game got cancelled. Early in 2008 we made a huge change to our forums. After many donations from our loyal forum visitors we purchased an Invision Power Board. A feature packed forum costing us $150 US dollars. In June, Sonic made the long trip to Los Angeles and visited EALA for the Red Alert 3 Community Summit. This was a great trip. Not only did we meet many of EALA and C&C developers, we also met with many of the great C&C fansite people. Oh yeah, we also got to play RA3 before anyone else in the world! October of 2008 officially made it our 11th year online. During this time we gave copies of the C&C3 Deluxe Edition in a community wide, joint EA sponsored, contest. We also awarded a prized copy of the original RA2 Collectors Edition in another contest. Late in 2008 we introduced the CNCNZ.com Store. For the first time ever anyone could purchase affordable quality shirts and merchandise with the official CNCNZ.com logo on it. We kicked off 2009 with a bang, that bang was the announcement of Red Alert 3: Uprising. In Febuary, about 1 year later, our forums were upgraded by merging the downloads section into it with the IP.Downloads, an addon for Invision Power Board. Despite some technical issue that we eventually managed to solve the change was a good one. Allowing much improved file management for CNCNZ.com staff and visitors. March 2009 saw the arrival of redesigned layout for CNCNZ.com. Designed to embrace people with bigger screen sizes. But it retained the classic “Blue Resurrection” style.